First I have to say well played. The first thing that popped up in my head when I read the last words in the novella was well played. The book had a snarky tone throughout making good use of the third person voice it employed. 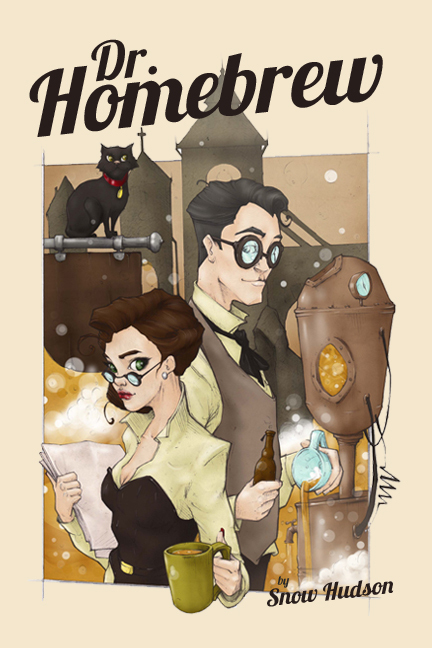 Dr. Homebrew (a fantastic and original idea in my humble opinion) is set in a dystopian/steampunk environment where Lake Ltd. has a monopoly on the brewery business ruling a small British town with a proverbial iron fist. Dr. Homebrew is standing up to the law providing the people with excellent beer compared to the crap Lake Ltd. makes. It incorporates Steampunk, Mystery, and science fiction quite nicely to make for a great read. Well a book like this doesn't appear in my e-mail everyday. The author (well actually Amber from the story e-mailed me the book) sent me a digital copy, but I decided to jump at the Kindle free promo because I prefer books in that format. Even though it wasn't on the top of my queue I thoroughly enjoyed it. It was 93 pages of secrecy, deception, business, smiles, and brewing! The characters were well put together and felt real someone you could actually imagine in real life which I enjoyed. Highly recommendable and an excellent wrap up at the end. 5/5 Easily deserves a high rating because it was a great book. That's probably why it was the #1 free Steampunk book two days in a row and now at around #70 paid steampunk. Book looks very promising in a category that is one of my personal favorites.